The Santa Fe offers standard Rear Cross-Traffic Collision-Avoidance (RCCA). This system uses the radar sensors from the Blind Spot Detection System to monitor for vehicles that are approaching when you are in reverse. If a vehicle is detected, this system will provide you with an alert, and it can also activate the automatic brakes when needed to help drivers avoid impact. 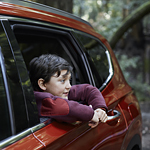 Another safety feature that comes with the Santa Fe is the standard Safe Exit Assist System. This system enhances your passengers safety by alerting them of traffic that is approaching from the rear when they are opening the door. When this system detects an approaching vehicle, passengers will be warned with a visual and audible alert.